It is obvious that a question which is too short will almost certainly lack context, and that a question which is too long may run the risk of readers never finding out what the question actually is (Some may not want to read the full question). Therefore, I was wondering: What is the optimal length in characters for a question? I would like to evaluate this statistically, using the Site Analytics (Data.SE) by Stack Exchange. From experience, I think there would be a global maximum around $3000$ characters. I suggest that we let the Number of characters (with spacing) be on the horizontal axis and the Percentage of upvotes to be on the vertical axis on the bar chart. Of course, if you can think of a better way of representing this (Rather than a bar chart), feel free to write an answer. Similarly, if you can think of a better metric to evaluate community response, feel free to suggest one in the comments or write an answer using that metric. Since I lack experience in programming and I have not seen any query which does this, I would appreciate it if you could show us the statistics and conclude with an optimal length. TL;DR: the longer, the better. Based on the current data, longer questions tend to get a higher ratio of upvotes than shorter questions. There is not enough data to determine an 'optimal' question length. 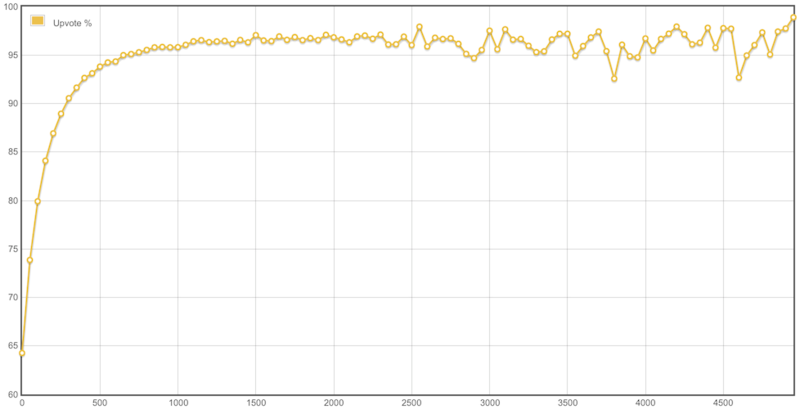 I constructed a SEDE query which lets you play a bit with the interval length, and the maximum considered length. Feel free to fork it to play around yourself. We see that shorter questions definitely score worse, but after 2500 characters the trend seems to halt, or at least it's hard to see the trend because of the 'noise' caused by the fact that there aren't that many questions in that range. Not the answer you're looking for? Browse other questions tagged discussion asking-questions statistics . What's the best fittest length for questions?